I loved this episode for so many reasons. It certainly isn’t without its issues or anything, and it would have definitely benefited from coming earlier in the season (but that’s a writing and narrative structural problem given the identity of Savitar wasn’t revealed until last week), but “Cause and Effect” reestablished many things about what makes the show good, spotlighted Iris in a big way, got us out of STAR Labs for a while, and offered some much-needed levity when things were starting to get a little too dark. Last week’s episode greatly frustrated me and I was worried that the show was being weighed down by its inability to move the plot forward. But, although many may argue that “Cause and Effect” is filler (and ok, it is), filler episodes at least establish some more development on the character side. 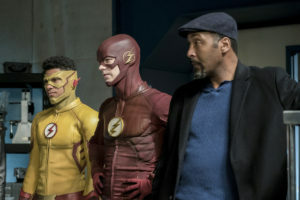 And, to be fair, the episode did move the plot forward in one way I hope will allow for a satisfying conclusion to the season (I have a whole grand idea about Iris, the speed force, Barry’s powers, and how that could come into play in the final episode, but I won’t get into that here). In the grand scheme of things, “The Flash” managed to make sense of the Savitar storyline to the best of its ability without causing too much of a headache, even though it still doesn’t quite explain why Savitar would be willing to kill Iris. If anything, my one biggest frustration with this episode is that it made Savitar’s reveal more about Barry. Iris brings it up, very calmly, but I can’t imagine she’s not a little terrified at the notion of someone who looks just like Barry trying to kill her. I know that Barry is hating himself right now, since Savitar exists because of his actions; it’s clear she knows it’s not really him, but I suppose I’d have liked to see Iris talk a bit more about the situation before she moves on from it. This is less of an episode problem than a problem with delaying the reveal and therefore depriving Iris, and everyone else by extension, of processing time and coming to terms with it before jumping headfirst into the next problem. There are still some things that should be done before the end of this season, but given that the characters will actually get to interact with Savitar soon gives me some hope that not all of Iris’ feelings about him having Barry’s face will be completely ignored. I do find the dichotomy of the storyline very intriguing. That Savitar is the exact opposite of what makes Barry a good person has a lot of potential and could even wrap up the whole Flashpoint storyline by coming full circle. 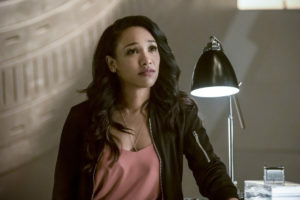 And if Savitar’s mission is to take Iris’ life, effectively ending our hero, then Barry could try to sacrifice his own and finalize the whole notion about how important she is (because the fact that no one has reassured her of her life’s importance kind of bothers me and I’ve brought this up a couple of times before). In all honesty, they could all have agreed to keep Amnesia Barry until after May 23, thus erasing Savitar’s existence, saving Iris, and then they could have given him back his memories. It’s just that Barry keeps asking why he can’t go to the extreme to save Iris and she always thwarts his line of thinking because there’s always something bigger than them that’s more important. But what the hell is the point of a superhero if he can’t take one win and save the most important person to him? My hope is that Barry will go to the extreme, while at the same time not going 100% dark. The power of love and all that? I will concede that Barry was willing to kill himself right then and there after finding out he was Savitar in order to stop him, so there’s that. I liked that Cisco didn’t push Killer Frost, but gently tried to remind her of who she was. If they are going to go with an (ill-advised) redemption arc, then there is no better person to bring her back to herself than Cisco. They have a deep friendship and that’s certainly been on display this season. But the problem here is that the show continues to be indecisive regarding the Killer Frost arc. Do they want her to stay evil or do they want her to return to being Caitlin? And didn’t Caitlin technically die? Cisco alludes to the concept that Killer Frost and Caitlin are indeed the same person, a concept I’ve stood by since the beginning. If that’s the case and she’s not an entirely separate personality, then Caitlin should be held responsible for a lot of her actions and it’s annoying that the show continues to ignore them. Joe has every right to not trust her and be scared of her, something I wish the rest of the team would do. Instead, they let her go back to Savitar? What, why? If they had kept her locked up, then that could have helped them stop Savitar. And why is she working with him anyway? The murkiness of it all rubs me the wrong way, but since Killer Frost could be a potential adversary to pop up every once in a while to mess with Team Flash, they should just keep her that way. Otherwise, why introduce Killer Frost to begin with? The show can’t have it both ways. These criticisms aside, this episode is contagiously fun. After a lack of Iris in the last three episodes, she’s finally given so much screen time and shining moments, and the episode benefited greatly from it. A commanding presence at STAR Labs, she took charge of the situation after it’s made clear that Barry no longer has his memories and demanded they find another way before prematurely zapping his brain again. I don’t even know where to start, but there was just so much Iris and so much lightness and it was amazing; it’s exactly what “The Flash” needed after a few episodes of too much doom and gloom. She was so happy to have some weight lifted off of Barry’s shoulders, and in a lot of ways hers by extension. Barry losing his memories allowed Iris to briefly push aside the events of a future that are drawing closer and closer. It was able to help her forget as well and with all that’s been happening, it’s not hard to see why she’d just want to live with this happiness for a while. 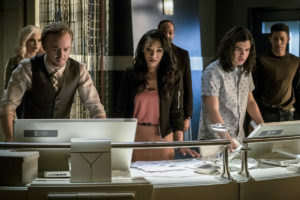 The episode also reminded us that Iris and Barry are connected in ways beyond definition. She is the reason his powers reactivate and the reason he eventually remembers his lost memories. Seeing all of that and watching them fall in love all over again reestablishes the idea that she anchors Barry and that their romance is central to the narrative. They want and need each other and this episode goes a long way in bringing that back into focus. 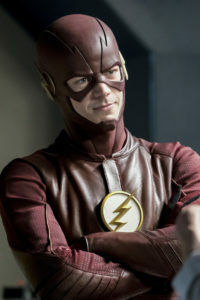 Grant Gustin gets to play three versions of Barry in one episode and all three were distinct and different. Savitar is cruel and too far gone, Amnesia Barry is carefree and adorably lost, and the Barry we’ve known for three seasons weighed down even more so than usual. Amnesia Barry’s interactions with everyone are delightful and refreshing and I agreed with Iris for a while about wanting to keep him around. He came close to reminding me of Earth-2 Barry and his presence in this episode is a reminder that “The Flash” is just better when it isn’t so dark. As a couple, Barry and Iris’ interactions are sweet, fun, and romantic in a way only “The Flash” can pull off and of course, Gustin and Candice Patton’s chemistry is out in full force. This show really lucked out with them and it’s because they’re so good together that the writers should take advantage of them teaming up for work-related stuff outside of STAR Labs in the future. But perhaps the primary and emotionally moving moment from the episode comes when Iris delivers the “visceral memory” speech about the night Barry came to live with her and Joe. 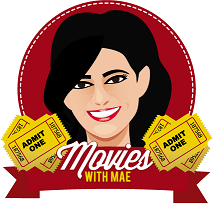 It was so heartbreaking, effective, and so well-executed that it was hard not to get goosebumps. Patton nails the scene, her voice assertive, but breaking with emotion in all the right places, almost as though Iris holds that memory very close to her heart. The scene also provides some wonderful backstory about the night of Nora’s murder, but from Iris’ perspective and how she felt. It was beautiful and perfect. “The Flash” talked a lot about wanting to stay happy versus accepting that things have happened and embracing them for the way they’ve changed. But I honestly hope that the show takes its own lesson and finds some kind of balance between having brooding and lightheartedness in the future. After all, as Iris says, “for every bad memory, there is a good one” and moving forward, the show needs to remember that as well. There’s certainly more explaining to do when it comes to Savitar, the true reasons behind Killer Frost’s alliance, and how Barry, Iris, and co. are going to stop them, but I’m inclined to just sit back and bask in most of the joy that made up “Cause and Effect.” Even though the show would have benefited from this episode coming earlier in the season, it was definitely a nice break to have going into the final episodes. Next week, Captain Cold, King Shark, and the showdown (I’m not ready)! I love those little moments when Barry says something off-the-cuff romantic (it’s like breathing for him at this point) and Iris gives him this shy look of wonder every time. Her voice also grows softer a lot when she talks to him, too. I love this so much. I think the new scene in Jitters tops the Flashpoint scene in Jitters. We learned so much in this one scene about the extent of Barry and Iris’ history and it was so playful. “You want to give me a perm?” “No, Steel Magnolias.” I laughed. Cisco’s hair is still looking sharp. I love it. Isn’t it nice when the show gives us new dynamics? Like when Julian and Cisco interact in the courtroom? Isn’t also nice when the show leaves STAR Labs every once in a while? How refreshing! Cisco was like a mad scientist running around with his ideas and I greatly enjoyed this. Barry can still decide to be a hero, as proven in this episode, even without all the tragic past stuff. “I’m your brother.” Barry looks down at his hand and looks back up, confused. I died. Wally’s expression afterward too was great. I cannot tell you how much I laughed during this episode. After five minutes, Barry didn’t even care that he had amnesia, he just wanted to know if he and Iris had sent out wedding invitations. Cecile only just found out about Barry being Flash and the poor woman is already hit with all this crazy amnesia stuff. Iris’ face falling after Barry asks about wedding planning made me sad. Baby WestAllen are too pure, too precious. That whole scene was just… my heart was on the floor. I was emotionally compromised. “Heat Monger? What an embarrassing name.” Oh Julian, how you’ve grown on me. HR and Tracy literally connected with each other over their coffee addiction. I just… that was too funny. Also, HR is probably going to die. I am convinced because of this subplot. It has now been confirmed that Iris also loved Barry before she “knew what the word love meant” and just didn’t realize it consciously because it was always there and normal for her. I love them so much. Amnesia Barry is too adorable and precious. Can we keep him? Joe is the only one willing to take down Killer Frost because he knows they can’t trust her. Smart man. It’s family first for him and she’s threatened that family before and again now by siding with Savitar. Barry wearing glasses in the courtroom. They looked good on him. Barry really loved Dragon Ball Z, ha! Seriously, I had a big cheesy grin on my face the entire time during this scene. They rarely talk about high school and I loved this. Iris wanted to laugh at Amnesia Barry so much. I don’t know that I liked Wally not having his powers because Savitar lost his memories. Does that mean he’ll lose them when they defeat Savitar? I’d be really sad about this. Teenage Barry’s style is “visual terrorism.” I laughed out loud! “Bartholomew Henry Allen. That is not a good name. Are you sure I don’t go by Bart?” I loved this shout-out to Impulse! Foreshadowing, perhaps? Cisco yells “catch” and Barry clumsily fails at catching. The way they all just peeked their heads out the door was too comical. I really like when Iris takes charge in STAR Labs. People are always panicking after things go bad and she gets them to keep their heads on straight. “We just walked into a buzzkill.” This is too true. “Are you a supervillain or something?” Killer Frost’s head tilt was pretty funny. She was like, really? Amnesia Barry likes the name “the Streak,” which is the name Iris first started calling The Flash. I loved this callback. For the most part, this episode made my heart happy. There's certainly more explaining to do when it comes to Savitar, the true reasons behind Killer Frost's alliance, and how Barry, Iris, and co. are going to stop them, but I'm inclined to just sit back and bask in most of the joy that made up "Cause and Effect."